It's what you display that defines you. There's just enough time to break off from work on other Digital Foundry material to deploy the newer, faster, more data-intensive DF analysis tools on the recently released Batman: Arkham Asylum demo. It's a 1.5GB download available from PSN and Xbox Live right now. It's a hefty download but one that's more than worth the time and bandwidth. Powered by Unreal Engine 3, it's another chance to see how well the cross-platform environment is suiting the individual console platforms. 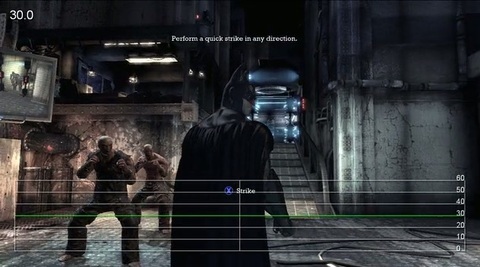 In the most recent brace of examples (Wheelman and X-Men Origins: Wolverine), the games were close, with a small frame-rate advantage to Xbox 360, combined with fewer torn frames. The inclusion of 2x multisampling anti-aliasing was also a tangible advantage for the Microsoft platform. While the versus/composite elements of the new Digital Foundry frame analyser are being tweaked and fixed, here are two videos to be getting on with rather than the usual composite: first the Xbox 360 game, swiftly followed up by a PS3 version showing action from exactly the same parts of the demo. Our survey says that based on the technical performance of this demo, nobody is going to be disappointed with Batman: Arkham Asylum. Both games maintain 30FPS for the most part with minimal screen-tear, and in our representative sample of around 17,000 frames, a mere 1.7 per cent of them were torn on PS3 compared to 0.2 per cent on 360. Due to the dark nature of the game, and the fact that it doesn't deal in fast, colourful action, even those torn frames were rarely noticeable. If the level of complexity in the environments increases in the final game, it's fair to assume that the disparity might widen (especially bearing in mind the additional tearing seen in the more open environments in the demo, most evident on PS3), but until we get retail code, we can't put that to the test. What is more apparent is that from a cursory inspection it's clear that the 360 has a marginal advantage in image quality, owing to the usual UE3 inclusion of 2xMSAA where there is none on the PS3. Again, the impact here is not so pronounced owing to the darker colour palette employed. 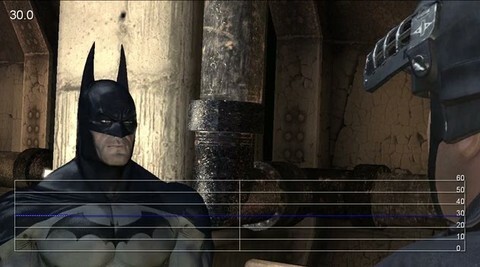 Other than that, differences are minimal - a motion blur effect used sparingly when switching between scenes in the engine-driven cinematics is absent on PS3, and just like Wolverine there are differences in some of the lighting, most notably with the inclusion of SSAO (Screen Space Ambient Occlusion) on 360 which helps adds depth to the scene. However, it has to be said that these effects are difficult to notice: the dark and the general gloom really is a great leveller. Based on the quality of the demo, this looks like being a great game regardless of platform - be sure to download the sampler at your earliest convenience and give it a whirl. I'm really looking forward to the full release now, and additionally the PC version should be a treat too. This build benefits from hardware-accelerated PhysX support, and as UE3 is typically relatively light on both CPU and GPU, it should be enjoyable to gamers even with a relatively modest gaming rig.